Our work in Kenya focuses on providing technical guidance to develop new approaches to natural resource management. Kenya has a strong extractives sector, though corruption and smuggling have prevented resources from truly benefitting all citizens. Over the past decade, significant structural and economic reforms have fed Kenya’s economic growth. Increased spending on health and education has helped to reduce child mortality, achieve near universal primary school enrolment, and narrow gender gaps in education. Yet poverty and inequality continue to impact a significant part of the population. High unemployment, crime, and the effects of climate change—including frequent drought—put Kenyans at risk. Other environmental issues including deforestation, soil erosion, flooding, poaching, and pollution increase insecurity. Artisanal mining is an important contributor to Kenya’s mineral wealth, with some estimating over 100,000 Kenyans directly involved in the sector. The country is also a major transit hub for natural resources being transported from the Great Lakes region to international destinations. Kenya is engaged in efforts to transform its natural resource management systems. Kenya is a member of the International Conference on the Great Lakes Region (ICGLR) and in 2010, the country’s President signed the Lusaka Declaration with 11 other Heads of State approving the Regional Initiative against the Illegal Exploitation of Natural Resources (RINR). Kenya’s key natural resources include gold, iron, steel, titanium, gemstones, water, and wildlife. Our research in the Great Lakes region investigates the drivers of the illicit trade of conflict-prone minerals and highlights recommendations for ICGLR Member States, including Kenya. We examine issues such as formalization of the artisanal mining sector, fiscal reform, harmonization of legislation, and strengthening of internal controls to end smuggling. We also provide analysis of certification, traceability, and due diligence as it applies to the 3T and gold sector for the Great Lakes region. 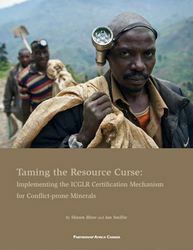 In 2011, we published Taming the Resource Curse: Implementing the ICGLR Certification Mechanism for Conflict-prone Minerals that outlined a certification mechanism for 3TG based on best practices. The mechanism was approved by all the Heads of State of the ICGLR, including Kenya’s President, in December 2010. As part of our work to transform mineral supply chains, we’ve led efforts to support traceability and due diligence. Since 2005, we’ve worked with the International Conference on the Great Lakes Region (ICGLR) to address the illegal exploitation of conflict-prone minerals—a regional initiative that Kenya is a member of. As a technical partner to the ICGLR, we are supporting the implementation of the Regional Initiative against the Illegal Exploitation of Natural Resources. We provide technical guidance to Kenya’s Ministry of Mines on implementing the six tools of the RINR which include the Regional Certification Mechanism, the Regional Database on Mineral Flows, and formalizing the artisanal mining sector. We provide capacity building and sensitization to policymakers from Kenya, as well as members of its industry on their role in traceability and due diligence. We advance dialogue with our partners in Kenya, including policymakers, private sector, and civil society to implement traceability and due diligence as well to ensure benefits reach miners and their communities. We engage governments to strengthen their internal controls, and encourage the private sector to put in place due diligence for their mineral supply chains.